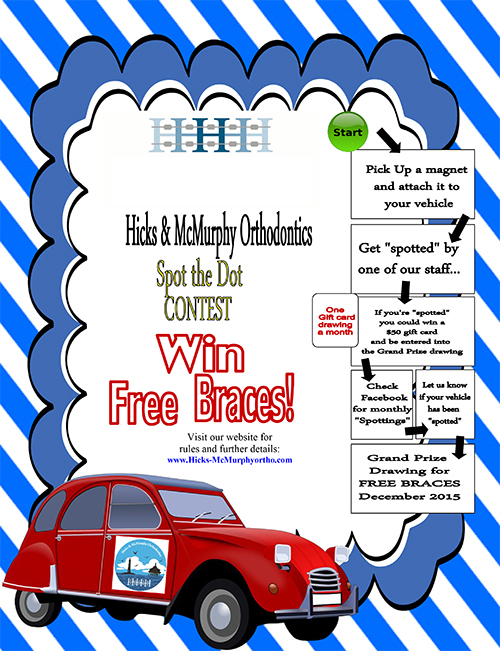 Here at Hicks & McMurphy Orthodontics we are excited to offer an amazing prize as part of our latest contest: free braces! From now until December you can pick up a special magnet at any of our locations. Simply place the magnet on your car and wait for one of our staff members to spot your car in the community! Once spotted we'll snap a pic and upload it to our Facebook page. That picture is your entry into a monthly drawing for a gift card and the grand prize drawing in December of free braces! Below we've compiled a step-by-step guide on all the rules and guidelines. We look forward to seeing your magnets all over town! Pick up a magnet at one of our offices during our normal business hours. Place the magnet on the back of your vehicle. Decals/stickers are also available upon request. The team will be looking for magnets at random times and at random locations within 30 miles of our offices. If you are found by a team member they will take a photo. Once a month, we will post photos of the cars our team members found with the magnet. If you see your photo that means you are entered in both our monthly drawing for a gift and our grand prize drawing in December for free braces. You are eligible for multiple drawings for both the monthly and grand prize drawings. So keep your magnet on your car for more chances to win. Stay tuned on our Facebook pages for monthly prize announcements, winners, and special events. The recipient of our Monthly and Grand Prize drawings must be willing to have photos taken and used on the Hicks & McMurphy website, printed materials, social media outlets, and other promotional marketing materials. Share with your friends and family this amazing opportunity! Only new patients are eligible for the grand prize of free braces. The Grand Prize may be transferred to friends or family or donated to a local charity. Treatment should begin within six months of Grand Prize drawing. Recipient may be required to receive care from another oral specialist before being able to start treatment and in this case this will be at the recipients own cost. Recipient should be a good candidate for orthodontic treatment. Recipient should be at least seven years of age. The Grand Prize cannot be converted into cash or exchanged for other services. The entire orthodontic treatment must be completed at one of the Hicks & McMurphy Orthodontics offices. The Grand Prize is for braces only; Invisalign® is excluded.